Baked chicken recipes are so easy to prepare and the variety of sauces you can add means an endless supply of easy dinner recipes. 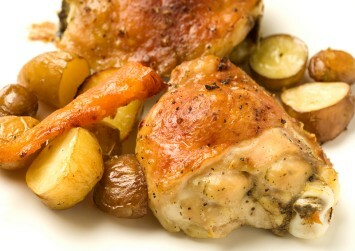 This baked garlic chicken with wine is not just easy but also elegant. It would make a great any night dinner, but also does double duty as an easy entertaining recipe. Peel and slice garlic into thin slices. They should not be crushed or pressed. Melt 1 tablespoon of the butter or margarine in an oven proof skillet or Dutch oven over medium heat. When melted, add chicken pieces and brown very, very lightly. Remove them from the skillet. Place a Dutch oven or casserole dish over medium heat and melt 2 tablespoons of butter. When it begins to bubble, add garlic and stir. Sauté for 3 minutes. MAKE SURE THE BUTTER DOES NOT BURN. Add the chicken pieces, turning them in the garlic/butter mixture. Try to get garlic on all sides of chicken. Season with 1/2 teaspoon of salt and pepper to taste. Pour the wine over the top and bake for 40 minutes. This recipe is great served with either rice or roasted potatoes and root vegetables, plus a crisp green salad. This chicken recipe is very healthy as it is. Here are a few tips to up the flavor and the nutritional value even more. More easy baked chicken recipes: Create a Tuscan garlic chicken by adding 1/2 teaspoon of dried basil or oregano to the garlic and butter mixture just before adding the chicken. Either of these herbs impart a wonderful flavor to the sauce. The alcohol in the wine burns off in cooking, but if you don’t want the wine simply replace it with an equal amount of chicken broth. Add a few sliced mushrooms to the butter and garlic mixture for more great flavor and added nutrition. This is also a low carb chicken recipe, great for those on Atkins or otherwise being mindful of their carbohydrate intake. Note: Diabetics may want to replace the wine with chicken broth. some diabetic medications don’t work well with alcohol. Check with your pharmacist or medical practioner. Find more baked chicken recipes here.